An evaluation of the overall program. The TIS program is managed and funded by the Australian Government Department of Health’s Indigenous Health Division. A total of 37 organisations have been provided funding through regional tobacco control grants. The funding is for undertaking a population health promotion approach to tobacco control, combining a range of evidence-based tobacco control activities to meet the needs of different population groups within a region. Rather than funding provided specifically for the employment of a tackling smoking workforce, the new program offers flexible funding for organisations to select from various evidence-based approaches with a focus on measurable outcomes for reducing smoking rates. Organisations involved in rolling out the program have the flexibility to select evidence-based mechanisms and tools to reduce tobacco use within their region, that suit the local context and utilise their strengths. accessing relevant training and networking opportunities (such as brief intervention training, smoking cessation workshops). Australian Indigenous HealthInfoNet, Edith Cowan University, Perth. The Indigenous Quitline enhancement grants aim to improve the capacity of Quitline services to provide accessible and appropriate services to Aboriginal and Torres Strait Islander people, including enhancements for young people, pregnant women and new mothers. This training provides brief intervention and motivational training in best-practice intervention methods aimed at increasing the number of suitably trained and qualified professionals working with Aboriginal and Torres Strait Islander smokers and their communities. The Innovation Grants, part of the previous funding round for the Tackling Indigenous Smoking program, supported innovative and intense activities to reduce smoking prevalence, through collaborative partnerships between research organisations and service providers. The aim was to increase the evidence-base for implementing effective tobacco control activities in regions or with groups requiring special attention, to support intense work in these areas of need. These areas included pregnant mothers, young people and Aboriginal and Torres Strait Islander people living in remote areas. Seven Innovation Grant recipients were announced in 2016. The National Coordinator is Professor Tom Calma AO. Professor Calma delivers advice to the Australian Government in relation to policy development and implementation in relation to Closing the Gap through Tackling Indigenous Smoking. He also provides leadership, support and mentoring to TIS program grant recipients. A national evaluation of the TIS program will take place. The evaluation of the TIS program for the next phase of the program will be split into a two-part process. The Cultural and Indigenous Research Centre Australia (CIRCA) will conduct part A of the TIS evaluation. The organisation conducting part B is still to be confirmed. A number of representatives from the NBPU TIS presented at the 2017 Australian Institute of Aboriginal and Torres Strait Islander Studies (AIATSIS) Conference. This presentation was an opportunity to: showcase the first year of the TIS program; reflect on progress to date; describe impacts made as a result of the program; and the changes made through working in partnership with the Department of Health, TIS Grant Recipients and the Consortium members. The presentation is available in audio format here. Some members of the NBPU TIS, as well as some Grant Recipients, also presented at the Australian Evaluation Society’s Annual International Evaluation Conference 2017. Their presentation was about Building robust evaluation systems in Indigenous health: examples from the Tackling Indigenous Smoking program. A pdf version of the presentation is available here. In 2019, Desley Thompson and Penney Upton from the NBPU TIS presented at the 15th National Rural Health Conference in Hobart. Their presentation was titled Making connections: a systems approach to Tackling Indigenous Smoking, and it focused on the work being carried out by TIS teams, as well as some of the challenges they face. There have been a number of Australian Government programs and activities over many years aimed at reducing the prevalence of tobacco use among Aboriginal and Torres Strait Islander people. 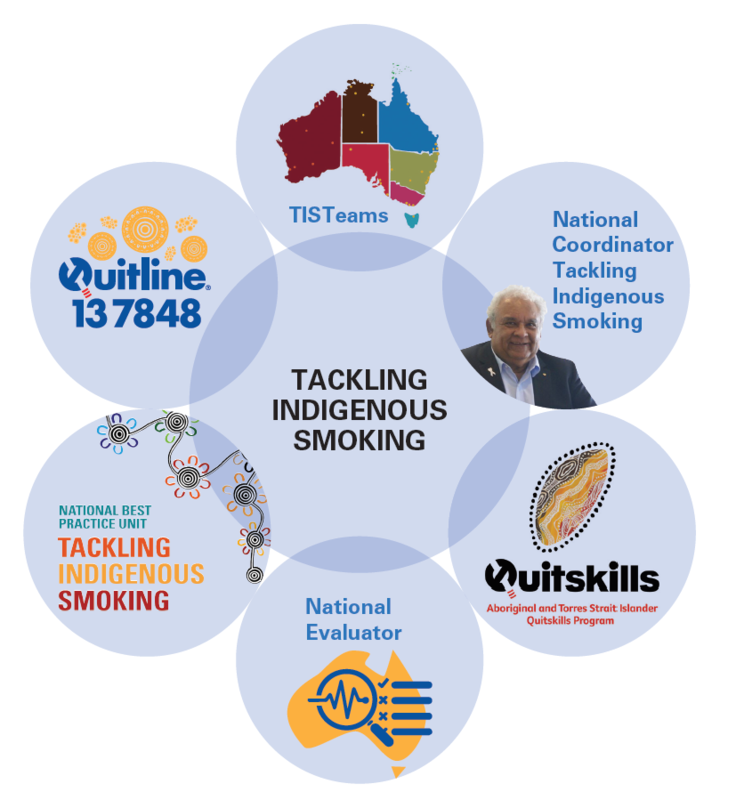 Tackling Indigenous Smoking has been delivered since 2010, initially through funding for Indigenous Tobacco and Healthy Lifestyle regional teams. In 2015 the TIS program was revised and updated following a review carried out by the University of Canberra on behalf of the Australian Government. From 2015 the emphasis for organisations delivering TIS activities (regional grant holders) is to make sure their population health promotion activities are based on evidence of effectiveness and that the impact which they are having on smoking in their region is measured. information/tools for evaluating and monitoring your activities. 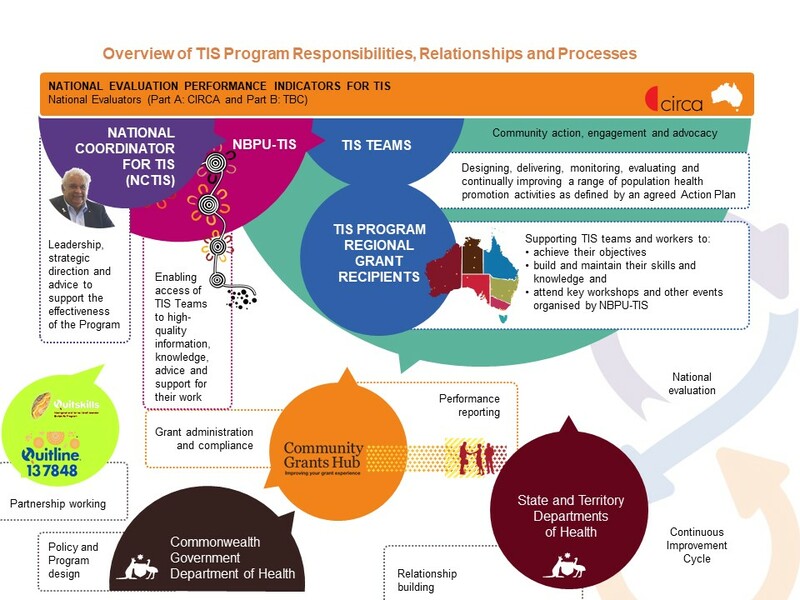 Organisations will collect and report data about their TIS activities which will feed into the independent national evaluation of the overall TIS program. What are population health activities for tackling smoking? National mass media campaigns that warn about the dangers of smoking and the benefits of quitting or never starting smoking. Some of these types of activities such as legislation to ban smoking or increasing the tax on cigarettes are best dealt with at a government level. They are important and recent evidence from Talking About the Smokes Policy and Practice Brief shows they can impact on smoking behaviours in your community but will not be part of the everyday business of organisations delivering the TIS program. Why are population health activities important? Population health activities are an important feature of overall tobacco control and are recommended by the World Health Organization (WHO). These activities aim to have a small effect on as many smokers in a population as possible. This is why health promotion activities target the whole community. It is also really important that the activities and information are repeated so that the small effect increases over time. Evidence shows that repeating activities and information can be very effective in motivating people to stop harmful behaviours such as smoking. Encouraging people to move in the right direction is therefore a really important feature of TIS activities. For preventing and reducing smoking prevalence, it is important for activities to happen at many different levels – whole of population (plain packaging, tobacco taxes), local community (TIS population health promotion activities) and individual (Quitline, clinical smoking cessation support). This is because all of these activities work together to move smokers towards deciding to quit, and then support them to give up and stay off the smokes. At the same time these activities remind the non-smoker why they should not take up smoking. improve access to targeted support to quit through clinical and non-clinical services. TIS-funded organisations are part of an overall preventive health system. Access to clinical best practices (behavioural and pharmacological) will help smokers increase their chance of quitting successfully. Developing skills to deliver brief intervention is also a key activity for TIS-funded organisations, which are expected to promote training opportunities for their staff and to other organisations. Developing and implementing smoke-free policies within their own organisation, and for other organisations is another key activity that the TIS program supports. Population health promotion activities and individual level activities that work. WHO (2003). Policy recommendations for smoking cessation and treatment of tobacco dependence. Sunstein, C. R., & Thaler, R. (2008). Nudge: Improving decisions about health, wealth, and happiness. Yale University Press: New Haven. Menzies School of Health Research (2015). Talking About the Smokes: Policy and practice brief. Volume 1, Issue 1. Department of Health (2015). Tackling Indigenous Smoking (TIS).